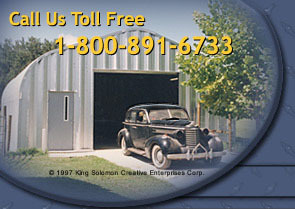 You may think that a steel building is a steel building, is a steel building. Not so with American Steel Span buildings. When you examine the specific components of an American Steel Span steel building you will find important characteristics that set our buildings apart from the competition. From a minimum of 23 gauge to 22, 20, 18, 16 and 14 gauge steel, an American Steel Span steel building is designed to withstand the wind and snow loads of a particular region. Our buildings have received Florida testing approval for high wind velocity up to 150 mph and carry the FL-5897 Florida approval number on side panels and FL-5897 on endwalls. Raw materials for our buildings are ordered to minimum specifications and tight tolerances. We use 100% US steel in all of our buildings and they carry a 25-year rust-through perforation limited warranty directly from the steel mill. All buildings are not created equal. Let us show you why.